← Day 6/7 along the South Bank Road to Banjul! Jennifer is taking a well-deserved break from the blog today therefore I, Cielianna, will be posting an update on this rest day. In case you don’t already know, I am Jenn’s little sister, more commonly known as Mama Cie. My nickname is a little ironic because I am the youngest one on the team, but I am thoroughly enjoying the trip so far. Today we are resting in the town of Soma, which is essentially a transit town between the Gambia and Senegal. 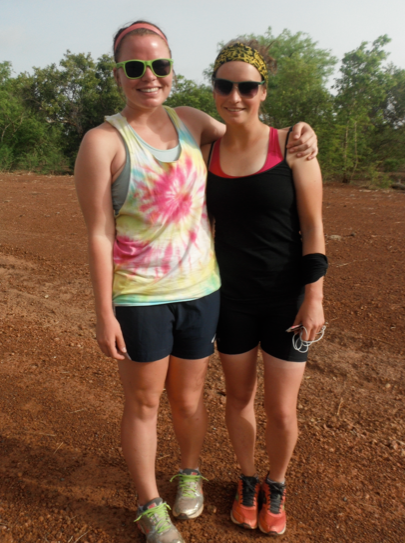 When Jenn first told me about the NSGA and Love4Gambia run, I thought she was crazy! The initial thought of her running such a great distance in extreme conditions seemed outrageous, but knowing Jenn’s relentless determination and drive, I knew she was serious about it. Not knowing anything about the organization or run itself, I did a little research and was very impressed by the focus and mission of the NSGA. 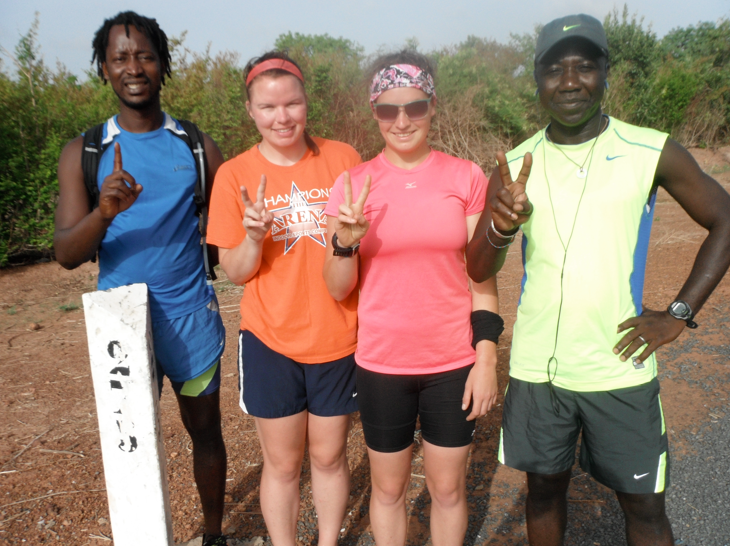 What an incredible program aimed at educating the youth of Gambia, I thought, this is exactly what they need and what better way to promote it than physically covering the distance of the entire country on foot. Mama Cie and De Runna, ready to get started! If you’re reading this then I’m sure you’ve been following Jenn and the team as we make our way west and you probably have a good sense of the team dynamic. This run would be impossible without everyone working hard together and its crazy to me that we only met less than two weeks ago when it feels like we’re a close-knit family. The team is critical to the success of the run and I think it’s important to highlight how essential everyone has been in helping Jenn complete her run. First there is Kebba, more commonly known as “Egewe”, the king of the team who provides wisdom and motivation tirelessly day after day. Next is Pa Modou, our media man, who loves cracking jokes on everyone and keeps the team in good spirits. Then there is Spider, or “bug”, one of the best storytellers, dancers, and cooks I’ve ever met. Jenn is most commonly referred to as “de runner” or “coach”, and she is the heart of the team as she inspires countless people every day with her incredible dedication to the Love4Gambia run. And finally, myself, the CGO (chief Gatorade officer) and team mom. Every individual plays a key role in the run’s success and it really makes you appreciate the value of having a functional and cohesive team that works well together. Personally, the most eye-opening thing so far has been witnessing just how widespread the NSGA Peer Health education programs are across the Gambia. The first time we passed by a school and hundreds of children came out to cheer Jenn on, it brought tears to my eyes to actually see the people benefiting from these programs. Before coming here I had no idea that there was so little information for young adults concerning their health, but now I can actually see how effective the NSGA programs are and just how many people are benefiting from them. I can only imagine how elated Jenn and the rest of the team must feel to see all of the local support and encouragement as we make our way across the country. It is especially encouraging to see that there are countless peer health educators throughout the various schools that are actively participating in the movement to inform their fellow classmates about the importance of maintaining healthy lifestyles. Their dedication and commitment serve as quality role models for everyone around them. It’s hard to believe that we’re at the halfway mark already, it feels like we just left Fajara on the long drive to Basse. As much as I can’t wait to see the team finish the run successfully and jump into the Atlantic Ocean in Banjul, I’m secretly wishing that the days go slower so that we can all enjoy this experience as long and as much as possible. This is my first time ever coming to Africa and so far it has been entirely fascinating. It’s difficult to put into words the exact feelings that rush through you as your plane lands and you actually get to see the people and the way of life here. For me, I had a wild combination of excitement, curiosity, awe, and wonder, and I continue to learn new things every day here. I’m so proud of my big sister and the entire team for all of their hard work in making the 2013 run a success so far. It has been incredible and I can’t wait to see what the second half of the journey brings. BANJUL CALLING! This entry was posted in Running in Africa. Bookmark the permalink.